Show off your creativity with the Hillsdale Tiburon swivel barstool. A geometric design with precise lines compliment the espresso finish and tapered legs. A neutral ivory fabric and contemporary design keeps your home looking fresh and sophisticated. Whether of a backless, metal, wood or armchair variety, the swivel bar stool makes it easy to rotate in any direction and allows you to be a part of the action anywhere. And with many stools topped with a soft fabric cushion, you can be comfortable while you sit. Our contemporary bar stools and swivel bar stools are designed with flair and sophistication, making them the perfect accent for the modern home. Beautifully covered bar stool leather seat covers by My Bar Stools. 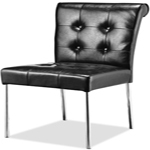 Browse our large collection of leather bar stools all at discount prices. 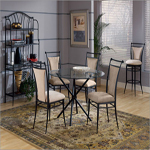 Elegant bar stools at unbeatable prices only at My Bar Stools. When only the best will do for you, we have the wine rack for you! Whether you are looking for a rack to hold only a few bottles of wine, or you need a more sizable rack for your extensive wine collection, My Bar Stools has a wine rack to suit your needs. My Bar Stools is the quality bar stool warehouse for wood bar stools, metal barstools, iron bar stools, home bars, and swivel bar counter stools. 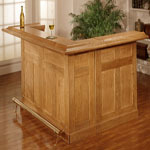 Over 250 warehouses of discount kitchen bar stools. You'll find discount name brand bar stool and kitchen dining stools such as Hillsdale Bar Sools, Powell Bar Stools, Pulaski Stools, and Winsome stools. Wood bar stools, backless stools, and wrought iron bar stools are available for your bar in 24 inch, 30 inch, and 36 inch heights. Looking for a custom size stool for your bar? 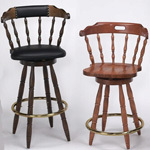 Our custom bar stool.com collection is perfect for bars and restaurants with special sizes. 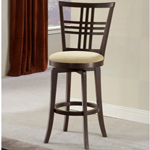 We offer both short and tall bar stools for your bar. Find a wood, metal, or iron bar stool in any size at my bar stools. 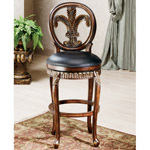 My Bar Stools.com offers the best wholesale bar stool and kitchen dining manufacturers nationwide.